Michael McCammon brings you advice on the healing power of nature. 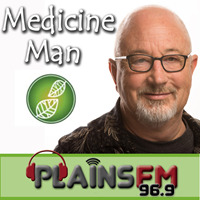 Medicine Man goes to air every 2nd Wednesday of the month at 9am. Michael delves into how herbal medicines can help improve health and well-being. Michael is an experienced naturopath, iridologist and registered medical herbalist and has been working in this field for for over 40 years. Medicine Man shares some tips to keep your bowel healthy. Medicine Man shares the wonders of Vitamin E.
Medicine Man tells us all about vitamins! Medicine Man and Di Foster join up again for another chat! A Plains FM show crossover! Medicine Man has Di Foster on the show, from Foster Wellness. An inspiring chat not to be missed! How can a toxic relationship be affecting your health?